SAN DIEGO — Three advocacy groups sued the federal government Thursday to block construction of a border wall with Mexico, alleging that the Trump administration overstepped its authority by waiving environmental reviews and other laws. The Sierra Club, Defenders of Wildlife and the Animal Legal Defense Fund seek to prevent construction of wall prototypes in San Diego before it begins and halt plans for replacement barriers in San Diego and Calexico, California. The complaint largely mirrors a lawsuit filed by another advocacy group, the Center for Biological Diversity, but the three organizations say they have hundreds of thousands of members, bringing more attention and resources to a legal fight over one of President Donald Trump's key campaign pledges. The government has waived reviews seven times under a 2005 law to speed construction of border barriers, including twice under Trump. The law allows the government to waive dozens of laws, including the Endangered Species Act and the National Environmental Policy Act, which requires extensive reviews of environmental impacts. The lawsuit contends the waiver authority expired in 2008, when the government met congressional requirements for additional border barriers. "An impenetrable border wall would divide wildlife and their habitat as well as families and communities across the border," said Jamie Rappaport Clark, president of Defenders of Wildlife. "It would bisect and isolate important Southwestern landscapes, pushing borderland wildlife like Peninsular bighorn sheep, jaguars and ocelots to the brink of extinction. U.S. Customs and Border Protection doesn't comment on pending litigation, spokesman Carlos Diaz said. The government recently awarded eight contracts to build prototypes of what Trump calls a "big, beautiful wall," each one up to 30 feet high. It plans to start construction this fall. 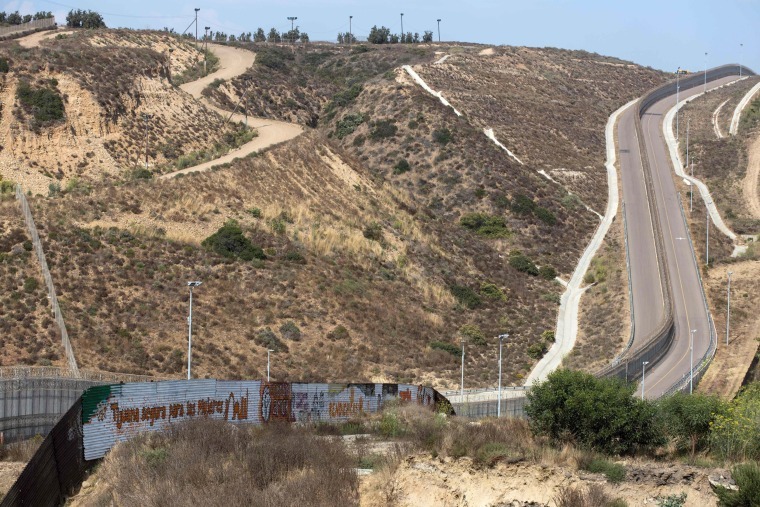 Last month, the administration issued a waiver of environmental reviews on a 15-mile stretch of border in San Diego, which encompasses the construction site for the prototypes and areas targeted for replacement fencing on one of the most fortified areas on the 1.954-mile border. On Tuesday, it issued a waiver extending 3 miles west from a downtown border crossing in Calexico, a desert city of 40,000 people.